Greeting from the Winter Wonderland everyone. Was able to get a good 7 mile run in this morning as the sleet was turning to snow. As soon as I made it back to the house, it was pretty much a light snow that has managed to hang on for the last 9 hours… and by hanging on I mean stay light because now is it’s coming down hard for what they are expecting to be another 9 hours. I can’t remember the last time we had two good snows with a little less than a week before Thanksgiving. Also do not remember having to bundle up as much on my runs this early in November (couple of runs ago it was windchill of 13 – F for my international friends). In an attempt to bring a bit of warmth to my office, let’s head back to Texas and check out my latest addition to the ol’ bird list. Hit the jump to find out what bird this is … apologies for the remaining shots. My last post broke up a streak of bad photography execution. Well, I’m back on the soft train. The first isn’t too bad in the sense it definitely highlights the key characteristic of this particular bird. Grained out a bit thanks to some horrible overcast at the time and a slight case of the jitters. This shot and the companion shot at the end were taken at Sabal Palm Sanctuary in Brownsville, Texas. I already covered the details of Sabal in my Ladder-Back post (link here). In that post the cause of the jitters was detailed – short version, on other side of the border wall, birding the Rio Grande and not a SINGLE person in the place. We did manage to get three new birds in the tin even though we were on a quickened pace. This blue-eyed specimen is called a White-Eyed Vireo. Later learned this was the second time I had encountered the Paul Newman of the birding world. This truly craptastic shot below was taken the day before at Laguna Atascosa National Wildlife Refuge. Not that it matters, but in neither case did I even know I had found it. This find was really confirmed in the digital darkroom. These specimens were originally overlooked being as there were only two shots from each location. As is usually the case when there is limited tin fodder, likely just caught a glimpse of it as it was passing through. Remember fellow birders, if it moves SHOOT IT. You can always toss it later if it turns out to be a dud. The next shot is for Ron – he likes ‘dem angles. Thanks to limited captures it is a short one tonight. However, it is a new bird and need to maintain protocol and give you something in recognition of taking the time to visit. 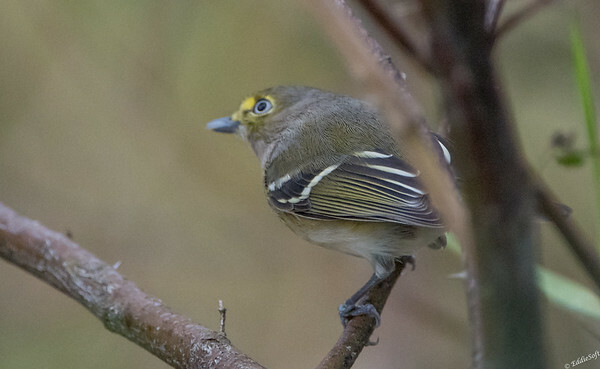 First off, Cornell’s birding site has two absolutely stunners for reference pictures (first two here), followed by an absolutely horrendous picture – 5th one in. Someone went crazy with the vibrancy – Was so bizarre had to go to my own reference library to confirm this birds does NOT have bright blue breeding plumage. Was fairly confident noticing the green leaves were also blue, but Cornell is usually not this far off. This species happens to be North America’s only fossil record out of all the Vireos thanks to a 400,000 year old bone found in Florida. They are an eastern US bird that winters along the southeastern cost down into Central America. It never ceases to amaze me when I have to travel all the way down to Texas to find a specimen of a bird that spends its summers in my home state. That also means this is a bird Ron should have no trouble gaining back ground. Time to break out the sled – take care everyone! 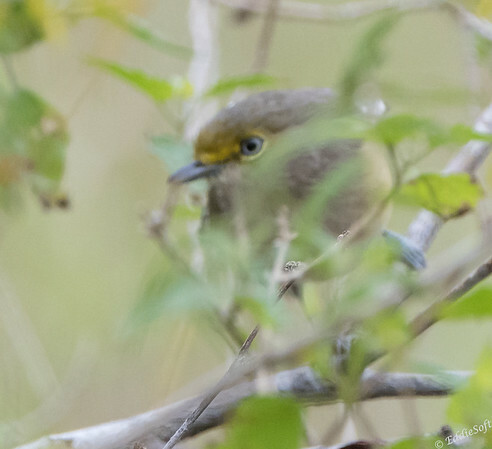 Nope, I have no White-Eyed Vireo photos–I’ve never seen one. I also looked up to see if there was any such purple version as shown on the Cornell site, and as you say there are none. I’m surprised that Cornell includes this picture. 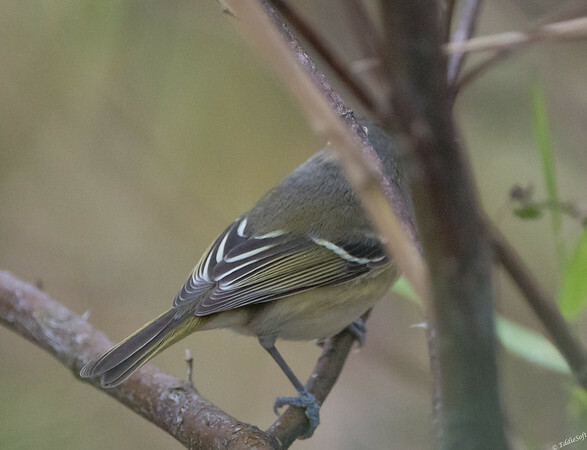 I got the Bell’s Vireo at Midewin near me! They hang around at the one trailhead we didn’t go at the times you were there. Unfortunate.